Lithgow Pubic Library supporters are hoping for a June vote on whether to borrow money for library expansion. 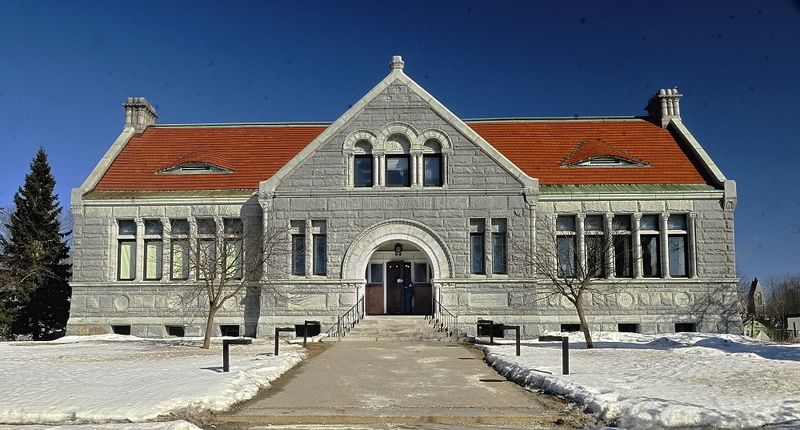 AUGUSTA — City councilors are expected to decide Thursday whether to send a proposal to borrow money and refinance debt to support a library expansion to voters in June. The city is proposing to borrow $8 million to renovate and expand the library and $7.6 million to refinance existing pension debt. The two potential bond issues are related and could be combined into one question or posed to voters as two separate questions, a bond attorney told city officials recently. Councilors are scheduled to decide whether to hold a June vote, as library advocates desire, or wait until the general election in November, when there would likely be a larger turnout at the polls. Also, it will decide whether the bond proposals should be voted on as a single question or two. The issues are related because refinancing the existing pension debt was proposed by William Bridgeo, city manager, and Ralph St. Pierre, finance director and assistant city manager, as a way to finance the long-discussed proposal to renovate and nearly triple the size of Lithgow, the city’s public library, without the need for a property tax increase. The idea is to spread out the cost of paying back the $7.6 million the city owes on a pension obligation bond it took out about 10 years ago from four years to 15 years. The city owes the Maine State Retirement System money for future pension liabilities. The proposal would mean the city could take on new debt to pay for its share of the library project without seeking a property tax increase, according to Bridgeo. The move would reduce the city’s yearly payments on the pension debt enough so the combined library and pension payments would be less than the approximately $2 million a year the city is paying now on the pension debt. However, it would extend the period of time the city would use to pay it back, costing the city more in the long run. Over the bond’s life, the city, by extending the pension bond debt payback from four to 15 years, would pay about $2.4 million more. Councilors, according to Mayor William Stokes, must decide Thursday whether to send the issue to local voters in a referendum in June or November. Some councilors, including Ward 1 Councilor Michael Byron, have argued for June so the project gets started sooner, reducing the risk of the cost going up before work starts. Others, including Ward 4 Councilor Mark O’Brien, prefer a November vote because it is likely to bring a much bigger turnout. If a June vote is desired by councilors, they’ll have to take action Thursday to meet filing deadline requirements. “We’re really under a time issue because if we do decide to go out in June, then we’ll need time to print ballots” and make other election preparations, Stokes said. The nonprofit Friends of Lithgow Library has pledged to raise $3 million for the library project. The Friends and city officials anticipate they will be able to reduce the cost of the estimated $11.7 million library project by about $1.2 million by seeking alternate ways to pay for some items and by eliminating other items from the project. In 2007, voters rejected a proposal to borrow $6.9 million for essentially the same library construction project by 243 votes. At the time, it was projected to cost $8.9 million, and the additional $2 million was to be raised privately. Councilors plan to meet at 6:30 p.m. Thursday in council chambers at Augusta City Center. They are also scheduled to discuss a committee recommendation to rezone part of the east side of Augusta, from the Kennebec Arsenal to Cushnoc Crossing Bridge; discuss selling a tax-acquired property at 12 Green St.; and hear a presentation from Augusta Housing Authority officials about their draft strategic plan. Councilors will meet before the meeting, at 5 p.m., for their first budget session as they begin their work on Bridgeo’s proposed $53.5 million city and school budget. The session, which is in conference room A, adjacent to council chambers, is also open to the public.